Rice Flakes Payasam is a yummy easy to make payasam. Almost every home rice flakes will be available in pantry through out the year. 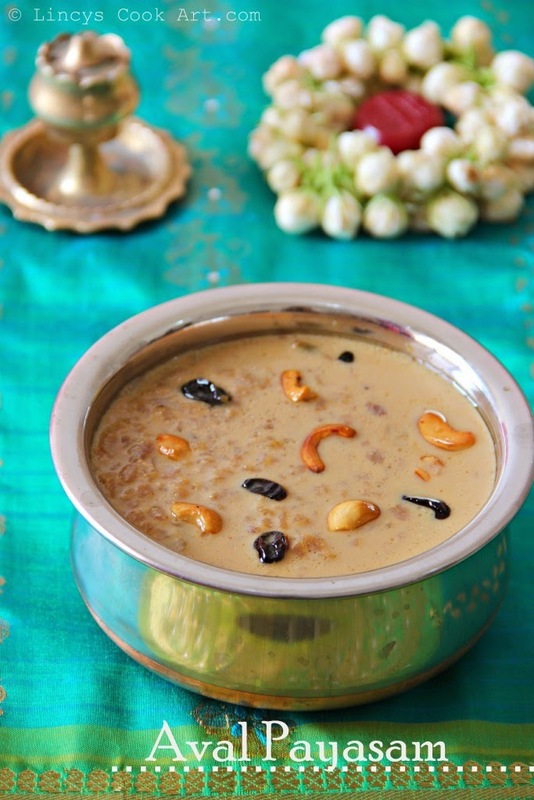 This payasam comes handy at the time of unexpected guest arrival and perfect for all occasions, festivals. Simple to make delicious payasam. I have used here red rice flakes for this recipe to make it little healthy. You can follow same instructions if you are preparing this paysam with white rice flakes. Roast the aval in a pan till roasted smell arises. Now the rice flakes becomes more crispy. Melt the jaggery in a separate pan with half a cup of water and sieve to remove impurities. In a deep pan add a cup water and allow to boil once it starts to boil add the roasted rice flakes and cook till soft. Add the jaggery water inside the cooking rice flakes and mix well. Allow to cook some more time to cook the rice flakes inside the jaggery water. Add some milk and allow just to boil if you cook more time jaggery may tend to split the milk. Add the cardamom, dry ginger powder and mix well. Add the coconut milk and just allow to boil and switch of the gas. Do not over cook it. Roast the cashew nuts and raisins in ghee and pour on top of payasam and mix well. Looks very divine and yummy. So delicious payasam,hard to take my eyes from ur clicks.